← What Makes “Good” Good? 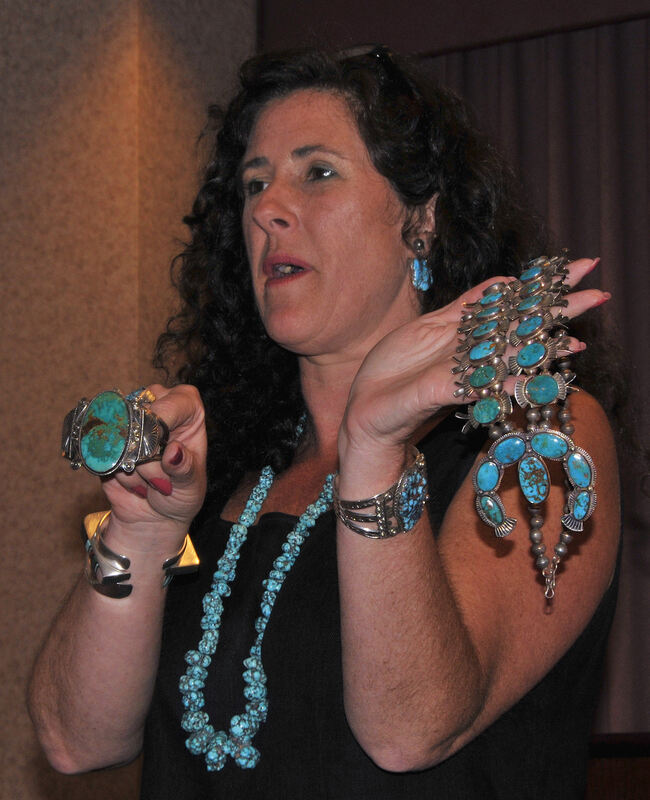 In April, Abbey Kent Flythe shared her extensive knowledge and enthusiasm about turquoise and Indian Jewelry. 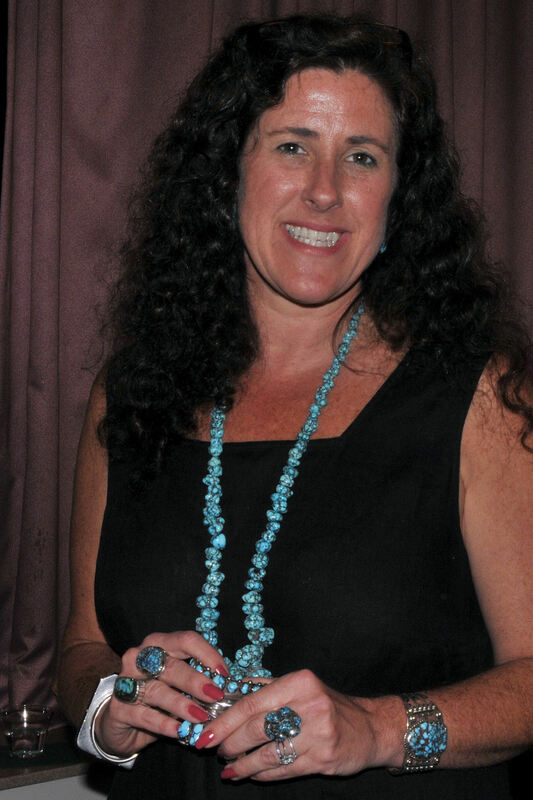 She grew up in Lancaster, Pennsylvania, and has been an enthusiast since age 7 when she saw her first piece of turquoise jewelry. Later, she worked at the US Department of Interior’s Indian Craft Shop for nine years and has been in business for herself for the last 13 years. 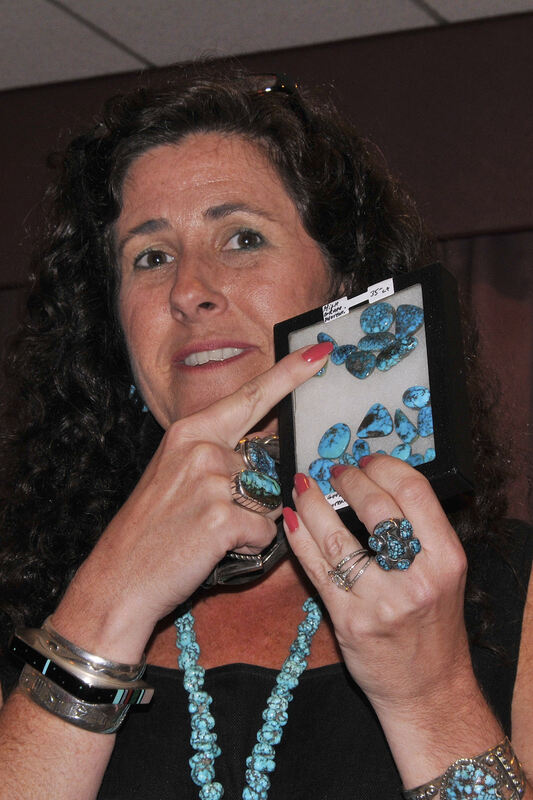 Abbey discussed the different characteristics of turquoise from its various mining sources and its use in jewelry by American Indian cultures. 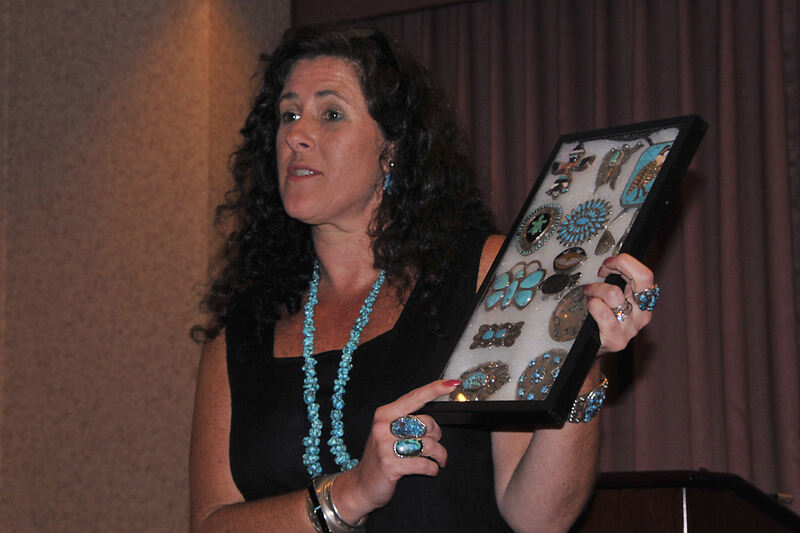 She brought samples of both old and new Indian jewelry artists. Originally silver coins were melted down for use in silversmithing, then traders moved in and brought silver ore. Fred Harvey started the “railroad jewelry” which was developed from the 1900’s through the 1930s and 1940’s. He gave the Indians cards with symbols to use on their jewelry such as crossed arrows and dogs. CG Wallace jewelry was prevalent in the 1920’s to the 1960’s. 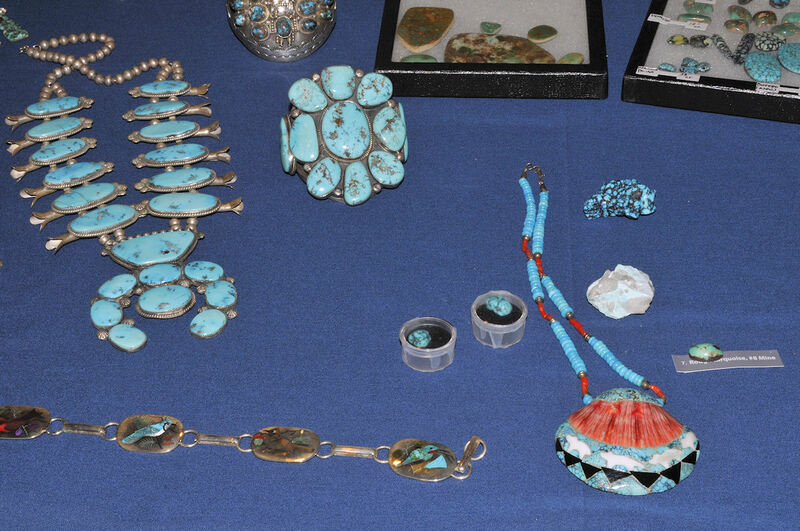 Traditionally the Navajo design around the stone and the Zuni were more into lapidary carved stones and the Hopi developed the overlay method using 15th and 16th century pottery designs on jewelry. Turquoise Unearthed, by Joe Dan and Joe P. Lowry. C.G. Wallace Collection of American Indian Art, Sotheby Park Bernet, Inc.
Skystone and Silver, The Collectors Book of Southwest Indian Jewelry, by Carl Rosneck and Joseph Stacey. The Navajo and Pueblo Silversmiths, by John Adair, 1945. Arizona Highways, Turquoise Blue Book, Indian Jewelry Digest. 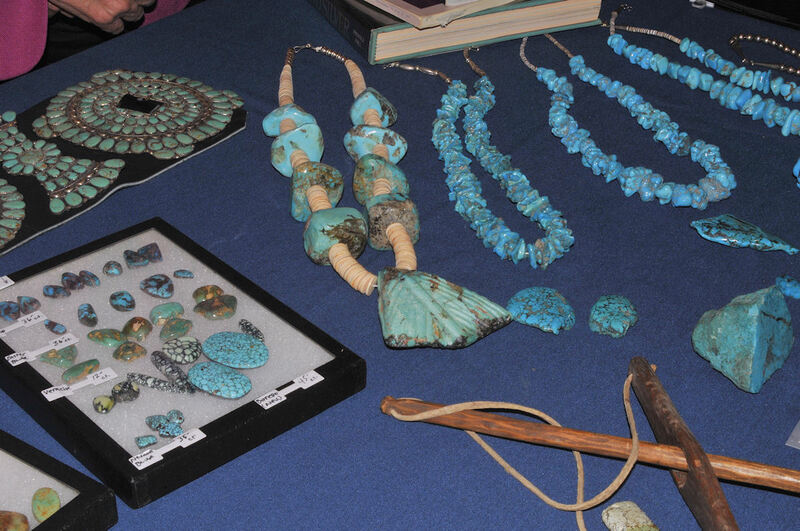 Turquoise, The Gem of the Centuries, by Oscar T. Branson. 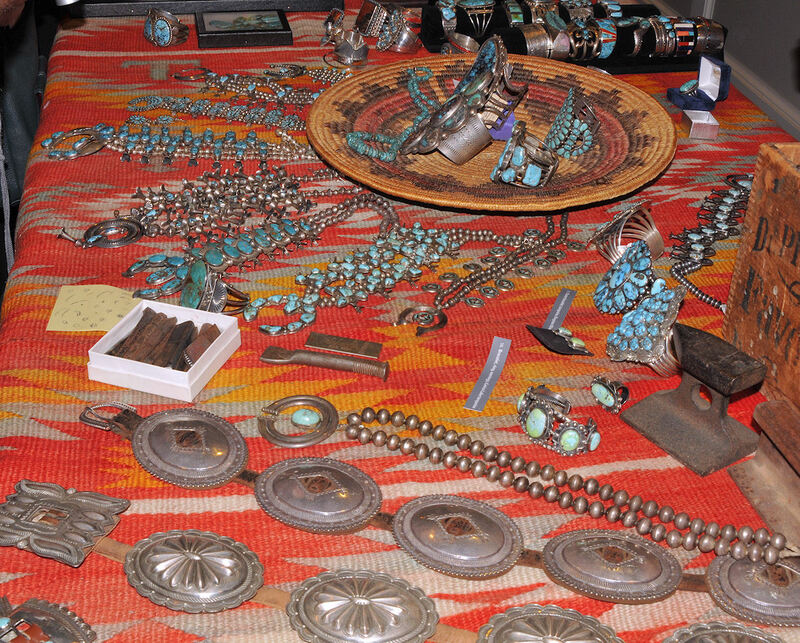 Indian Silver Jewelry of the Southwest 1868-1930, by Larry Frank. Ray Manley’s Portraits and Turquoise of Southwest Indians, by Clara Lee Tanner. I m so happy to hear that some one has a high favor in turquoise.